The public art project would be the world's largest if all eight tanks are completed. SOUTH PORTLAND – As luck would have it, Jaime Gili flew into Portland at night. That meant he would have to wait until morning to see his handiwork. 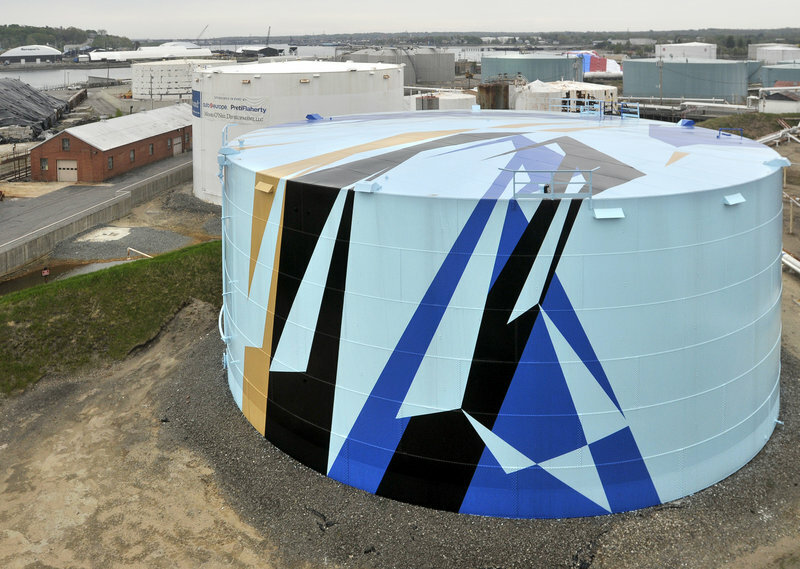 But Gili, the London-based artist who was chosen by the Maine Center for Creativity to adorn the oil tanks at the Sprague Energy tank farm near the Portland International Jetport, wouldn’t settle for daybreak. “I could still spot it,” Gili said, describing how he peered out the window of the plane into the dark during his nighttime landing, determined to catch his first view of the painted oil tank. Gili is back in town this week, preparing a second tank for his design in the Maine Center for Creativity’s Art All Around public art project. This one will be abstract like the first — lots of sharp, intersecting angles — but with slightly different colors: blue, orange, black and spruce. If time and money permit, the Maine Center for Creativity hopes to complete as many as three more tanks this summer. In all, the center aims to paint eight tanks and eight tank tops. To do so, it will need to raise about $1.2 million. To date, it has raised about $600,000, said Greg Boulos, president of the center’s board of directors. 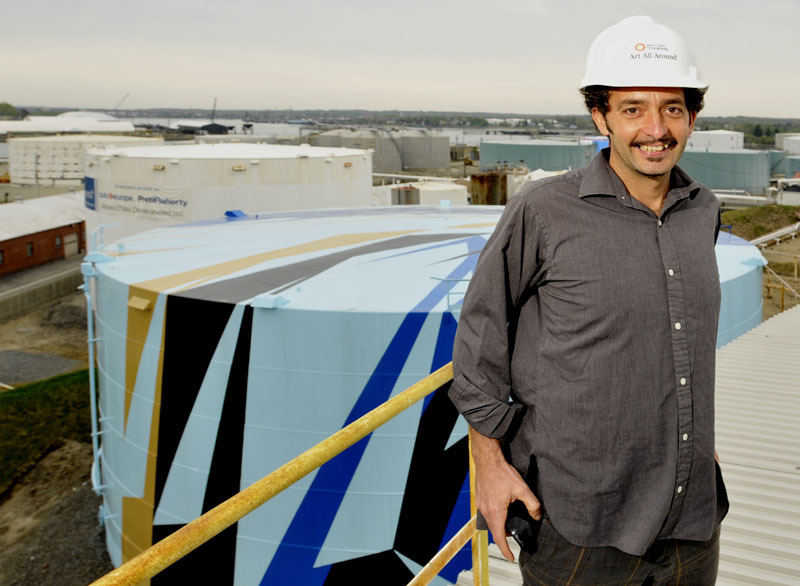 Gili wasn’t in town last fall when the first tank was completed. He has seen photos of the tank, and he worked closely with the painters while they executed his design and vision. He was in daily, and sometimes hourly, contact by phone and e-mail during the painting process. But seeing the tank was something else altogether. “When you get up close, it’s awesome,” Gili said. The Maine Center for Creativity hosted a press conference at the South Portland Community Center on Monday morning to bring attention to the second phase of the tank project. Members of the center’s board, its supporters, business people and municipal leaders turned out to rally for Art All Around. When completed, the tank project will involve 260,000 square feet of painted surface, making it the largest public art painting in the world. Charles Lawton, a business owner in South Portland and a member of the Maine Center for Creativity’s board, said Art All Around is good for the Maine economy because it emphasizes the link between creativity and industry. That link is essential to economic growth, because creativity leads to job growth, said Lawton, who writes a column for the Maine Sunday Telegram.